Tandleman's Random and Particular Thoughts on Beer. A bit of a CV. Tandleman is a veteran beer lover, local CAMRA Chairman and activist, beer writer, beer reviewer and pursuer of all things good in beer. On our final day in Haarlem we spent a fair bit of time just wandering round on a bright, sunny and somewhat windy day. As we weren't flying until after nine, we had plenty of time, so interspersed wandering with the odd beer here and there. As I have already remarked, the Dutch seem a tough bunch, being completely unflinching as they drank and chatted in the open air while I gently froze. Maybe they all had thermal drawers on? Dunno. We had agreed to meet our friends in one of the local pubs just across from the hotel where our luggage was being stored. Our first choice, Café de Zwaan, was thronging and had a DJ though it is a pretty traditional local boozer and one we had visited several times - and liked. He was the worst kind of DJ. He was a singing DJ. Even worse, he was a Frank Sinatra singing DJ, so we did it our way and buggered off across the road to Het Wapen Van Bloemendaal, described outside as "Golden Oldies Café". Well not sure if we actually qualified, but near enough, so in we went. We'd been there before and noted one of these really top notch bar staff, who remember you immediately. She found us a corner and we watched as a folk group set up. The placed was rammed and there seemed little doubt that the group were popular. As they started their set to much enjoyment by the customers, our waitress came over. She explained to me they concentrate on Dutch national songs and thumbing a nose at the increasing use of English instead of Dutch in everyday argot. Clearly we couldn't understand the words, but it was all very jolly with customers joining in the chorus and laughing a lot. The place was going like a fair. After a couple of beers we left to get our bags. We'd been treated well by staff and customers and I reflected that a bit of gentle poking of fun at others is pretty damn universal and if done without malice, isn't such a bad thing at all. 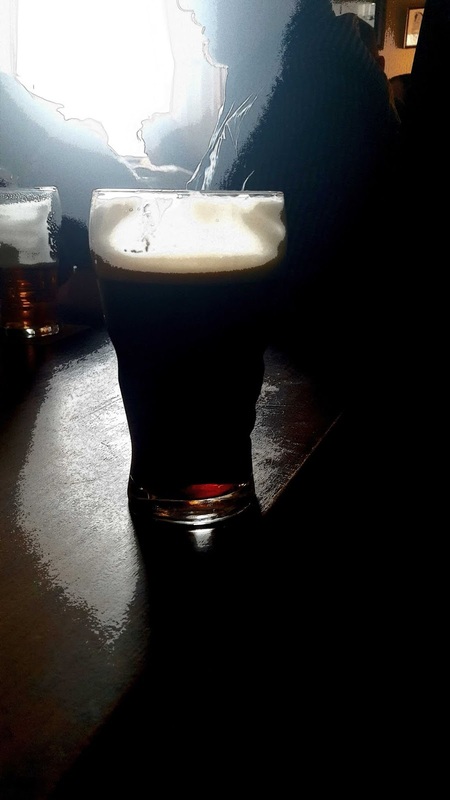 At best a local pub should be welcoming and warm, have a great atmosphere and be nonthreatening. This was the case in every way here and it was good to see the Dutch being themselves amongst their own folk. And why shouldn't they? Sunday afternoon entertainment in Dutch pubs? Is this a thing or were our two just a co-incidence? The bus back to Schipol Airport was on a dedicated bus only road all the way there. Not a bus lane - a bus road. The other road was alongside. Wow. When we assembled in Haarlem for our AGM - "we" being BSF the Foreign International Beer Bars at the Great British Beer Festival - we arranged to meet at Uiltje Bar, which was for us at least, very handy, being a couple of minutes away from our hotel. This is a fairly narrow bar with not much room and we soon filled it. Even more so when the Scots lads appeared. A few bewildered Dutch made up the numbers. We all needed a drink to get over the price of the drink though. Think €3.50 upwards for 0.2l which to most of us was really just a damp glass. To save you the arithmetic it works out at around £8 a pint for the cheapest and the sky the limit for the rest. Given that we obviously at the arse end of a Left Handed Giant tap takeover and there wasn't many Dutch beers on, it wasn't that conducive to merriment. A few of us soon escaped to a more mainstream bar across the road where choice was oddly enough a little better, with some decent local lagers, abbey beers and De Konink at prices that didn't quite make the pips squeak. 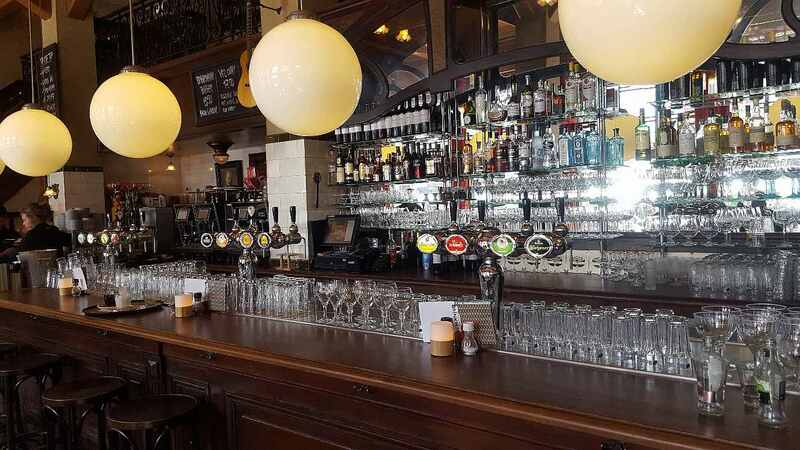 Also an improvement was a chatty woman behind the bar who knew how many beans made five and happily talked us through what we could expect pubwise in Haarlem. All in all a much better deal. After a while we made our way to Jopen, a brewery in a converted church with a fantastic looking in-house brewery, a brilliant atmosphere, decent beer and rather good grub. We realised though there, as subsequent pub visits confirmed, that drinking in the Netherlands is not a cheap experience, but given the right environment, it can be a very enjoyable one. 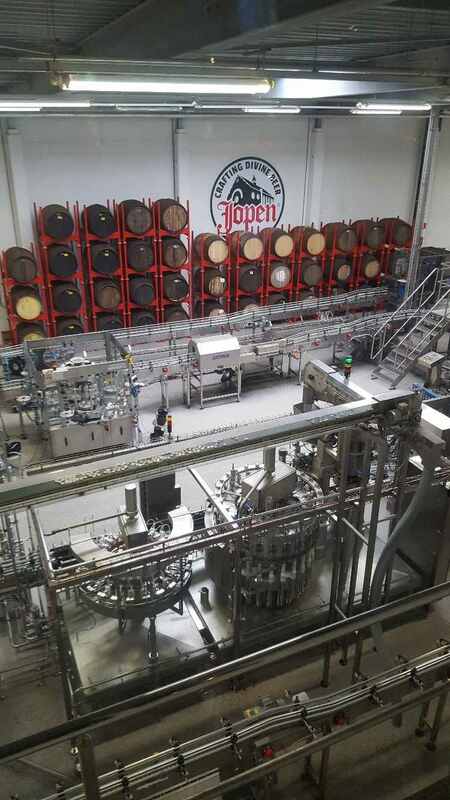 Our AGM was held in the main Jopen Brewery and Tasting Rooms (Proeflokaal) on the outskirts of town. 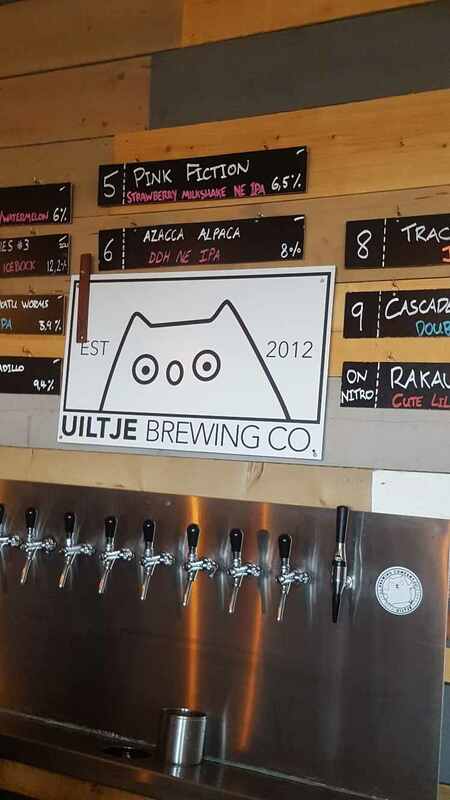 This was impressive too and had the advantage of another brewery tap (Uiltje) being round the corner. To our (relative) deep joy, this offered 0.3 measures - all at €4 - so we left for our next two brewery tap visits in a jollier frame of mind. The Dutch countryside, apart from being flat as you'd expect seemed to consist mainly of motorways and modern industrial buildings. It all looked as if it had been built yesterday. This was by design a mystery tour and somewhat unnecessarily so. Like being on a ballistic nuclear submarine on patrol, almost none of us had the faintest idea where we were going when we set off, had no idea where we were when we got there, or, when we got back, where we'd been. The brewery taps, as in most craft beer outlets, could have been anywhere, with a range of identikit beers and lookalike bars with keg walls, which could be anywhere in the world. Craft beer innovative? How so? There was one bit of gentle relief. On the outskirts of Utrecht, on yet another industrial estate, the De Kromme brewery tap was small. 48 thirsty folks leaped out of the coach and crowded the bar. A drink would be a while we surmised looking at the solid wall of backs. I'd spotted a restaurant next door though. We nipped in. They were prepping for dinner but had a bar. Could us five come in for a drink? "Of course" we were told. Just the job. 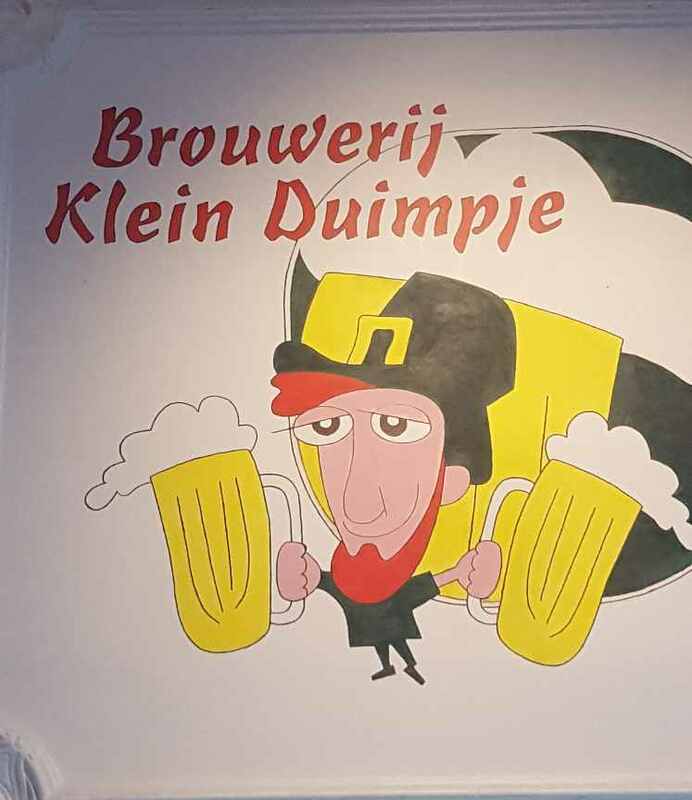 Gulpener was gulped and repeated and we joined the noisy throng and a much reduced queue in time for a couple of black IPAs before leaving for our final stop at Klein Duimje (Tom Thumb) which was far more pubby than the others. Full of well pissed locals and an astonishing number of beers, it was my favourite by far. The beer was good, we didn't care about the price by then and it wasn't on an industrial estate. Nothing not to like. Our return to Haarlem was not by motorway. Instead, to prove an older Holland exists, it was quaint villages and large posh houses. Still bloody flat though. Back in Haarlem we just went to some local pubs for non craft beer. I was crafted out by then. In case you are wondering how I recalled all this stuff? Photos on my phone and a bit of t'internet of course. None of this taking notes faff. It's a rather pretty place Haarlem. There are no chain stores here, or at least very few. Many of the shops are artisanal in some way, with painters and potters cheek by jowl with fashionable boutiques, second hand shops selling upcycled this or that, or posh clothes. All are exquisitely, no painfully, constructed, coiffured, dressed and decorated to look lovely. And they do. The canals are edged by high gabled houses, timeless in the Dutch style, but grey and austere. Instead of the merchants that no doubt once lived there, they now home lawyers, accountants and the like and have carefully polished brass plaques. But they they retain their grandeur still. Move away from the huge main square, the Grote Markt, dominated by the massively impressive St Bavo Cathedral and at right angles to each main or side road, you observe ever so quaint streets of single storied terraced cottages. In London they might be called mews, though these are not exactly the same, but probably here as in London, some at least were built for servants of the rich and likely for their horses too, as yards abound. This was and still is a wealthy city. Around the main square there are a number of bars and cafes with tables and chairs outside. In late March, the weather, while bright and sunny, still has a winter chill. The Dutch though are hardy and fill every chair, while young men and women scurry about waiting on them. It is an impressive sight. At just after one in the afternoon, there isn't an outside seat to be had. The customers are a mixed crew. All ages from young to very old are represented. The older folks generally drink wine and are very well dressed. The young men and women are fashionable and cool. They smoke furiously and mostly drink beer, though iced tea and soft drinks arealso evident. Middle aged folks drink beer. Abbey beers from Belgium are common and popular, the tables dotted with Affligem and Grimbergen bottles and glasses. Some sophisticates evendrink Duvel Triple Hop, though with a plane to catch I was warned off that very firmly. Belgian beers abound, though the odd Gulpener brings a touch of Holland. Whatever they are drinking, young or old, you can feel the money here. Picking the grandest building of all, we nip into Grand Café Brinkmann. It has been serving the population food and drink since 1879 and is all big windows, marble floors, solid wood, chandeliers and has a massive staircase and gallery. Most important of all though, it has a very impressive fin-de-siècle bar, which to my eyes at least, is the centrepiece of a wonderfully characterful room. From the warmth inside we were able to watch the much-tougher-than-us souls outside, with the added bonus of observing the very dedicated young waiting staff working at lightning speed to serve the hundreds outside with food and drink. It took a little time for us to be served, but the apology for the delay was so charming and the place so interesting, that didn't ruffle any feathers at all. 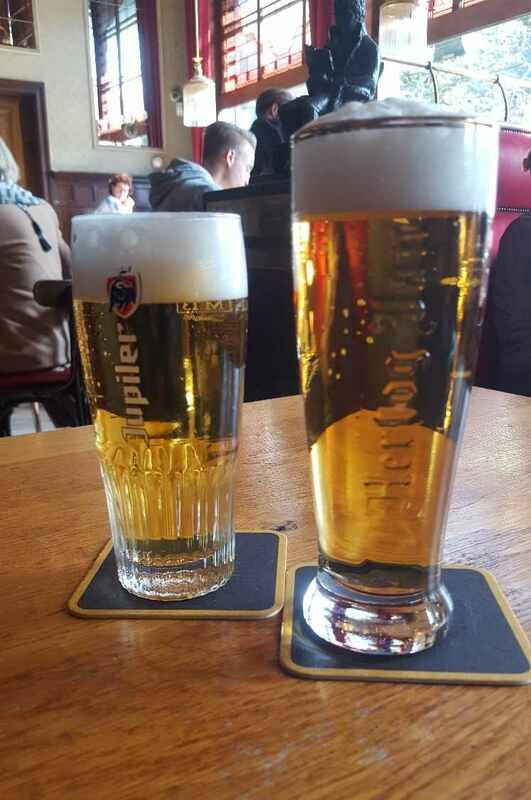 As sipped our beers - Hertog Jan for me and Jupiler for E - we people watched while the whole scene buzzed around us. Better than outside? You bet. The beer choice was overwhelmingly Belgian and that seemed just fine with the customers. We stayed for two, but I had the surprise of a further beer being sent over by way, I assume of an apology for the delay in service. This was a classy place to go and we only wished we'd known about the inside before our last few hours. More homework and I might just have got that Duvel. Don't expect cheap beer in the Netherlands. Even in the humblest of places you'll pay €3 for 25cl of cooking lager. That's £6 a pint at current exchange rates. For anything grander, anywhere from €4 upwards. Next time I'll mention Dutch craft and a proper Dutch working man's pub.Guess which I liked best. I've been busy today editing our local CAMRA magazine, More Beer, but Twitter has caught my eye in between times. Firstly a spat this morning about how CAMRA is supposedly supporting Brexit and a subsequent stream of CAMRA bashing and quite a number of age related hate posts. Funny how we all know what sort of things are completely unacceptable to say openly and we are pounced on for the slightest transgression, but when it comes to CAMRA, it seems all rules are suspended and ageism is deemed by many to be unremarked and tolerable. On the substance of the matter, CAMRA centrally may have at best expressed something badly and at worst been incompetent, but surely a little show of moderation in responding to this would be better? Yes us over sixties may well all be "c*nts", but I've news for the young - that's the direction you are headed in too and trust me, things will look a lot different when you get there - though getting some practice in for your future role might be beneficial I suppose. Better to campaign for a preferential duty rate for cask beer on the basis it is an endangered indigenous product perhaps? @FullersJohn makes a good case for this to encourage more cask production and increase brewers margin on the product. This makes a lot of sense as it isn't price per se that makes brewing cask beer unattractive - it is brewer's margin. As John Keeling explained it to me, 100,000 barrels at (say) 20p a pint less duty is big bucks for a brewer. Brewing more of it in such a case would suddenly make commercial sense. I think he is on to something here and CAMRA should explore this further. I liked too a tweet about a pub not a million miles form my London place. The East London Advertiser highlights the case of a pub which has live music and has successfully applied to have a deed of easement agreement to prevent future complaints about noise from live music when a new block of flats is built nearby. This is a good thing. To my mind if you buy a flat next to a pub that has loud live music, then that's your lookout. Affecting the business of a venue by complaining about noise that was there before you showed up is pretty unfair in my view, so good for Tower Hamlets. Others will hopefully copy. The last thing that caught my eye was the somewhat surprising news that after only a year in the job, CAMRA is losing its Chairman Jackie Parker. CAMRA has announced its new chairman elect: Nik Antona will take on leadership of the organisation following the @CAMRA_AGM in April 2019. Is there more to this than meets the eye? Dunno, but that may well come out, one way or another, in Dundee at the AGM and Conference. Right. Having got that off my chest, back to More Beer editing. Hopefully more posts next week when my magazine has gone to bed. Meantime off to London tomorrow for a few days, with a visit to Canterbury on the side. Yesterday there was a Twitter post that caught my attention. It referred to an opinion piece in Imbibe Magazine by Jessica Taylor in which she claims that "We’re on the precipice of a cask revival". The article goes on to explain her thinking which can be summed up - more or less - that cask can revived - wait for it - by modern brewers adopting Golden Ales.Well I exaggerate, but I hardly agree either with the way the article says "cask is becoming ever more exciting, flavoursome and stylistically broad" as if we've all been drinking flavourless crud for all these years and can only be saved by innovative craft brewers rescuing us from our own stupidity. Try telling that to Phoenix of Heywood for example who have been brewing a West Coast IPA before many of the innovators were out of nappies, or the nearly 40 beers beginning with word "Gold" or "Golden" in the 1998 Good Beer Guide - and that's not counting the dozens more that have "gold" somewhere in the name. In that same edition there are herbal beers, spiced beers, lemon beers, cherry beers, ginger beers. Beers made with liquorice and chillies. I could go on. It isn't new folks. It has all been done before. So we need modern craft brewers to show us the way and revive cask? These are the same people that give you cask beer that looks like chicken soup and undermine the work done by brewers for many years to ensure clean, clear, bright beer with distinct flavours.We'd more or less lost the "Its meant to be like that" nonsense until craft got its hands on cask. Now it is back with a vengeance, as overturning the orthodoxy has given bar staff the right to say it once more, even if the beer looks like a mixture of lumpy fruit juices and smells like Henderson's Relish. Another thing in the article disturbs me more than somewhat. This is written as if cask ale is in decline everywhere and needs bolstering by a few hip breweries making their version of it to show the rest of the plebs how it is done. Well not here in Greater Manchester it isn't. Ask Marble, Blackjack, Brewsmith or Brightside and many more? Or Lees, Holts, Hydes and Robinsons who all sell tens of thousands of barrels of it a year. Or Marstons, the biggest brewer of cask beer in world. Or go to West Yorkshire, Lancashire and the Midlands and so many more areas of the country. Sales might well be declining, but in these places it is still drunk in volume. And here's another thing. Most cask beer is designed to be drunk in volume. Do we really think the odd craft brewery producing the odd batch of "stylistically broad"cask is really going to save cask for the future? Of course it might help their demograhic to appreciate it more - and that's good - but save it? I think not. Oddly enough our dear friends BrewDog revived cask by bringing out a trad version of the cutting edge"Dead Pony Club". Not much by way of "cask is becoming ever more exciting, flavoursome and stylistically broad." there then, though Cloudwater hit the nail on the head with its (clear) non golden beers while its pale (cloudy) offerings didn't hit the mark at all. Pick the bones out of that if you can. I do agree as always about poorly presented cask beer - who doesn't -and the need to attract younger drinkers - but this article postulates a world in which a small number of trendy breweries will be the saviour of cask. This strikes me clearly as pie in the sky and undoubtedly somewhat London-centric despite references to non London brewers in the article. No, this is all looking through the wrong end of the telescope. We already have the poncification of keg beer to the extent that all too often it is sillier and sillier. I don't like to cast my rose tinted spectacles too much on the North of England, but fortunately most of our breweries, even the trendier ones, produce decent cask beer, albeit too often pointlessly cloudy. The point here is the picture around cask beer is endlessly varied. As it always has been. Does it need the craft treatment? Really? So is cask beer in danger? Yes and no. As always with cask, you have to keep supporting it and drinking it. I'll be chairing a debate on the subject of "The Future of Cask" at Manchester Beer and Cider Festival. We have a cracking panel. Come along and see what they have to say. Ironically the vast majority of small brewers produce cask beer. It isn't just the big boys and regional and family brewers. The Great Manchester Beer Debate will take place on Saturday 26th January at 15.00. We have Sophie Atherton, John Keeling, JulieO'Grady, John Clarke and Ian Fozard. Fab or what? Picture the scene. You park your car up and set off up an unmade farm track which looks as though it has recently undergone an artillery bombardment. You have already noted the dodgy looking lane, but having done so, you are walking, which most do unless you are a farmer, or the milk waggon going to one of the farms; or have a complete disregard for the future of your car's suspension. You take in the air; your many welly clad children happily splash in the potholes. You may visit the monument set high on a hill with views over to Rochdale, Oldham and Bury and the Pendle Hills beyond. You say "Ooh look. I can see the television transmitter at Winter Hill. My goodness is that Jodrell Bank over there in the Cheshire Plain? (it is)." You eyes drift downwards to the cluster of farms below. "I think there might be a pub down there" you chirrup. "Let's find out." Then it all starts to unravel. For some. As you manoeuvre downwards, sinking up to welly top height in muddy fields, or plod through cow muck, you observe a little old pub with farms all around it, but with no made road on either side. You enter and as your eyes become accustomed to the somewhat gloomy interior you realise that this isn't the shiny little gastropub you'd hoped for. Instead it is a fairly rough and ready local pub, with a single room - though you might be lucky and find the small snug open. The bar is pretty well blocked by locals. A number of oldish men are sitting at a table by the door laughing loudly. They look up and say "Hello" as you enter. There are dogs everywhere. You realise that you have found: a) a hidden gem b) a nightmare pub with no redeeming features. What happens next depends on you. You can fight your way in and squeeze yourself and your offsprings into whatever space you can find. There isn't much for anyone. You ask about food but are told it is only toasties and then only if there is time to do them. (You observe that there is only one person behind the bar and you deduce that as the pub is rammed, making toasties might be a tad inconvenient and accept that fact gracefully). You order crisps and drinks for everyone and join in the merry throng noting that in fact there are several families there, the many dogs are friendly and that while the pub is fairly rough and ready, there is a splendid buzz of conversation. Nobody minds about your muddy boots, your children, or indeed you. You note that with the roaring fire, it is, though quite old fashioned, not at all unfriendly. There is a lot of laughter. And, when you settle down inside, it really is all rather cheery. You remember the benches out front and side and figure that should you visit in summer, you can sit outside with your pint and your other half and watch the world go by as your children caper about. You think "Actually this is not so bad really." Or, you could write a horrible review of this dreadful dump on a well known rating site when you get home. Anyway. Sounds just like the sort of place I'd like to spend some time in. Wonder if the beer is any good? I 've been neglecting this for a bit now, largely because I'm to to my eyes in the Manchester Beer and Cider Festival for which I'm Deputy Organiser, but hopefully when all that is out of the way, I'll buck my ideas up a bit. 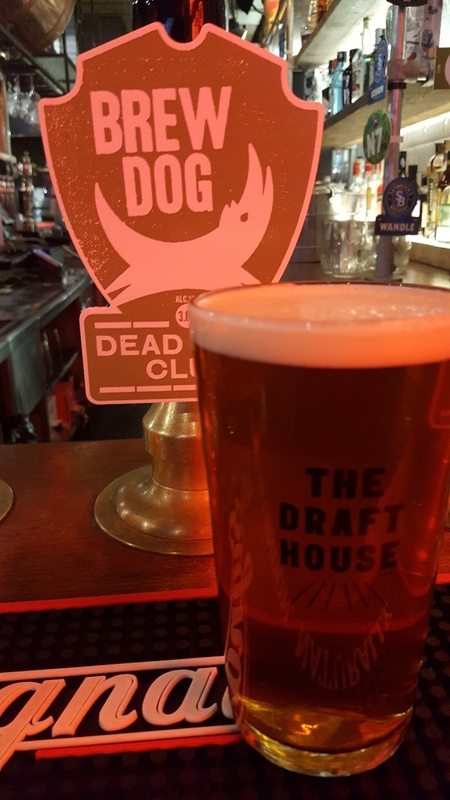 In the meantime, I forgot to give my views on the return of Brewdog to cask beer via a cask version of Dead Pony Club (3.8%) which I tried at the Draft House in Seething Lane a few weeks ago. Well I say a few weeks, but actually it was 21st November when I was last in London, so not so long ago really. A couple of things. I wondered if there would be much change in the Draft House offering since Brewdog took them over and first impressions are that nothing much has changed. Maybe a bit more BrewDog on the bar - well definitely that - and possibly a decrease in choice in other areas - but still plenty to go at and all much as before. I'd previously given up on the rancid cask offering here, preferring by far to drink Tankovna Pilsner Urquell. Many visits and really poor cask had put me off trying, so given that it was a quiet Wednesday afternoon, I wasn't optimistic. Nonetheless a pint was obtained and duly supped. It was fresh, well conditioned and actually pretty good. With its malty base and hoppy finish, it was a very decent pale ale (or standard bitter since it was in cask form) which I would happily drink again. OK, it didn't set the heather on fire, but I can well understand why BD chose this and I look forward to seeing more (and more adventurous) stuff on cask from them soon, remembering as I do some of the fantastic beers they used to produce. Trashy Blonde (not an acceptable name now I guess) and Alice Porter being two I remember very fondly. So from me, a qualified "Welcome back" and well done on sorting out the cask quality at the Draft House, though I'll be back later this week to confirm improvement has been maintained. Don't forget to come along to Manchester Central for the Manchester Beer and Cider Festival. It will be fab and is of course very reasonably priced. We are having a day out in Winchester on Saturday - so tips for musn't miss pubs welcome. It was the coldest night of the winter so far when E and I made the half hour walk from our flat in E1, across Tower Bridge, at this time of the year mercifully, virtually tourist free, heading to Enid St in SE1 to give the newest Cloudwater Taproom the once over. We bickered our way merrily along through dodgy looking streets, though having been that way before, it is less dodgy than it appears. As often is the case of our minor disagreements, we were violently agreeing with each other; the difference in our preferred navigation being about "along one then over a bit", or "straight along and over a bit less". Such are the vagaries of thirty odd years together. The Taproom is in a railway arch, brightly lit and narrow, with a cold store at the rear to keep the beers cool (certainly not needed that night) and for off sales. There is a bar, bottom right with taps at the rear in the usual craft style. A number of beers - ten or so - were offered in various sizes, all at £4 a pop. Waiting for our companion for the evening, beer writer, Matt Curtis, we started with a very decent Helles Tettnanger which was bang in the middle of the helles style and on a warm day would have been even more pleasurable. On Matt's arrival, we tried a few of the others with varying degrees of success. I liked the lightly smoked IPA - or maybe it was just pale ale, quite a lot, thought the Cranberry and Papaya Sour both smelled and tasted likely mildy gone off Vimto. Okay if you like that sort of thing, but worth £8 a pint? You tell me. Nothing really grabbed me, well, not quite true. The cold did. Like a vice. 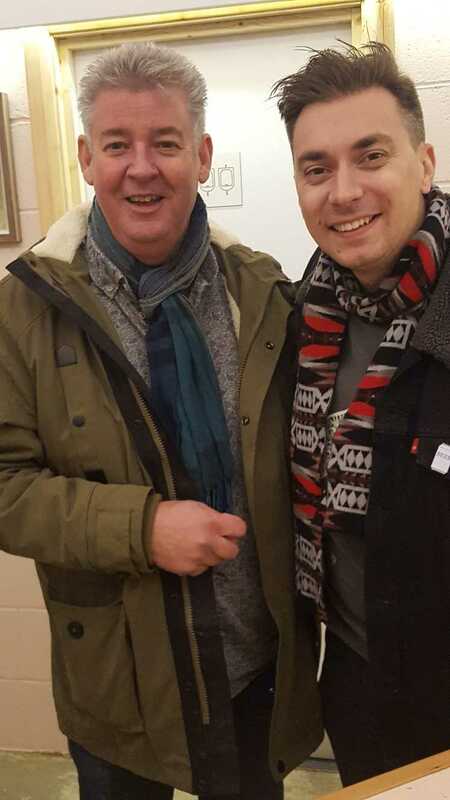 My hands were freezing as some acquaintances from The British Guild of Beer Writers remarked as they shook hands. It was bitterly cold and I worried for the barstaff. How cold? Well, frankly it would have caused Ranulph Fiennes to check his fingertips and cuddle his husky and bit more tightly. Maybe I'm just a bit nesh though. Which brings me on to another point. What's the attraction of a bitterly cold railway arch with the sort of beers on sale that you can get elsewhere for around the same price, but in relative comfort? Beats me really, but there were quite a few people there on that cold Wednesday night. I have been in this neck of the woods in summer and sitting outside people watching - if you can get a bench or whatever - is pleasant enough, but so is sitting outside a proper pub. For me these kind of visits are an occasional "something different" thing, but I know for others it's a way of life and how they like to drink. Sure beats me, but as I say so often, in craft related stuff, I'm not the target audience. 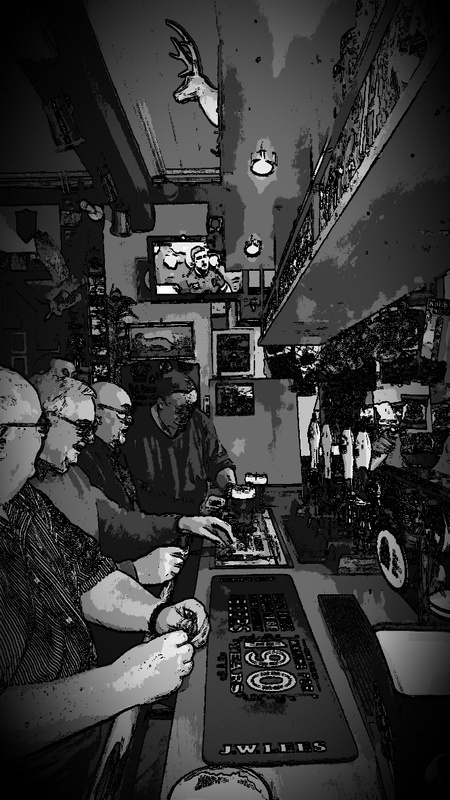 But in this visit at least, the company was good and of course beer - as it usually does - and this is what really it is all about - engendered the social lubrication that enhances and tranforms an evening out and makes your surroundings much less important than the people you are with. 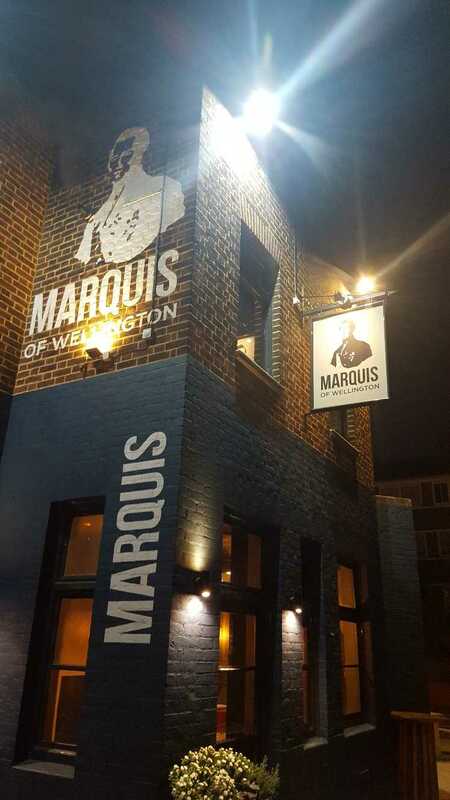 We left eventually and having spotted a pub, new to us, along with Matt, we popped into the Marquis of Wellington to be immediately enveloped in warmth in a virtually empty, but very pleasant pub. The beer was pretty good too, so we'll be back. Thanks too to the lovely folks from Duvel-Mortgaat for their surprise company, the excellent chat and the beers.